Throw lines are an essential safety addition for any kayaker. 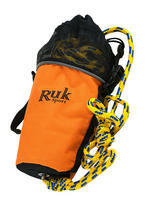 This RUK line is 15m in length and comes with a mesh storage bag for quick drying when it's not in use. Also features a reflective strip around the bag for safety in low level light conditions.